John Walsh (John the yank) who passed away recently in New York. John was a regular visitor to Oughterard over the past number of years. Many people will have fond memories of John who along with his local “lookalike” were like twin brothers. John lived in the house his uncle (Brian Walsh) left him some years ago. 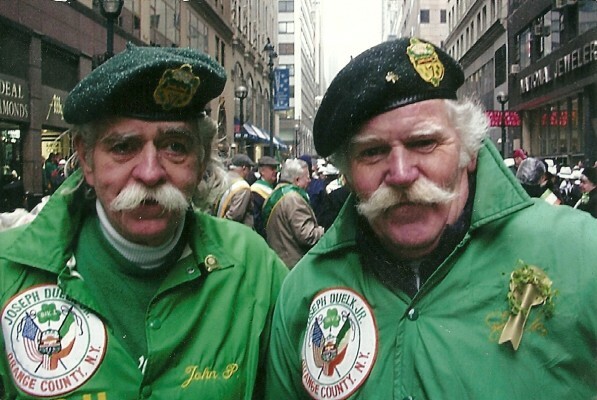 John pictured on the left here with his best friend Tom “Mahongy” Walsh (RIP) at the New York St Patrick’s Day Parade 2004. John was a retired New York police officer and was taking part in the retired NYPD parade. It seems Mahongy was an honorary retired NYPD cop for the day! Rest in Peace John.